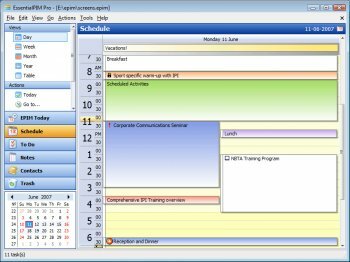 EssentialPIM Pro Portable is the advanced version of Personal Information Manager that will handle all your calendar, contact, to do and notes needs in an easy- to- use, manageable form. It is U3-compliant and works straight from your removable media, whether you use a USB flash drive, compact flash card, or even a good old floppy. 2. No student discounts. Very strange. Greed? Outstanding! Great for traveling. Don't even need to hook up to your ISP or web host! This is an excellent PIM package. With its organisation sections and contact lists, where would you be without it? EPim is the best ive seen, and with its nice cool user interface, I think id have a hard job trying to find something any better. Nice program. XP autodetects it from USB. It has got same featers as desktop version except this is portable. This is pretty nice, now you can take your schedule with you on the road via thumbdrive or whatnot. Excellent.